The sound of the coffee grinder interrupts the peace of the quiet morning. Outside my kitchen window, I’m not surprised to see another thick coating of snow on the driveway innocently weighing down the tree branches in my yard. Dreary days are not uncommon where I live in Kelowna, BC. I moved here about 5 years ago from Colorado. My winter training in Colorado always involved riding outdoors, no matter what. I’d be the crazy person heading up the dirt roads in the canyons after a big snowfall. But not here. I tried that once or twice, but the humid, frozen air caused hypothermia and I had to make a sheepish phone call to my husband to pick me up. Before I moved here, I never rode indoors. In fact, it was a badge of honor not to. As a pro mountain biker who is known for being mentally tough and taking on the hardest races and enduring the toughest of conditions, it was hard to fail at outdoor winter riding when I moved here. The logging roads and paved road shoulders are consistently piled with slush and snow, only to melt with the spring thaw. These days, my winter cycling is different and in a lot of ways, even better. Before I found Wahoo, I despised any trainer I tried. In fact, my first winter in Kelowna even had a day where I was curled up in the fetal position in bed, tears streaming down my face because I hated riding indoors so much. Then I was introduced to the Wahoo KICKR. Skeptical about indoor training and generally even more hesitant to try another trainer, I reluctantly gave it a try. The result was a dramatic difference from my previous experiences. It was easy to use, I didn’t have to endure the ever so annoying rear tire on rubber feeling and smell, the power settings were accurate, and I could even ride my mountain bike on it. I often race long single day mountain bike races or 7-day stage races abroad, even in January and February. Training exclusively on the trainer would be a new test. Would it be good enough? I tried a few of the many programs compatible with the KICKR and landed on TrainerRoad. Four years ago, I headed to the seven day Trans Andes in Chile and from riding the KICKR, I was actually race fit, even for multiple long days in the saddle. I won the race and ended up performing very well in early season races. Training indoors became the new norm. The trainer desk was a welcome addition to my set-up. I used my laptop to shamelessly binge watch Netflix guilt-free, watch RedBull TV and even email on my easy days. In fact, I have a rule that I’m only allowed to watch addicting Netflix series episodes on the trainer. It helps me stay motivated to ride longer or even to get on the bike. I broke my foot at the end of October last year (tripping on my clog!) and started my trainer riding early. Fast forward a few months. I just finished my first race of the season – a brutally hard and technical 50-mile mountain bike race in El Paso, TX. The result? A win and a course record. After years of training indoors in the winter and repeated positive results, I no longer doubt the power of training inside. The only downside to indoor riding in the winter to prep for early races was sometimes my back would get sore because I wasn’t riding in a climbing position. The way you engage your quads and back is different when you’re climbing. This year, I was delighted to see the addition of the KICKR CLIMB and KICKR HEADWIND Smart Fan. Yes, I’m very spoiled but I’m so thankful for my set-up because I actually look forward to my indoor rides. I’ve experimented with the CLIMB by loading mountain bike race routes onto my ELEMNT BOLT and using it to control the incline of the CLIMB so that it mimics race courses. I post a lot about my training and set upon my Instagram account. It’s very apparent that I am always riding my mountain bike on the KICKR which seems to surprise some people. My SCOTT Spark has boost spacing in the front and rear, and the KICKR accommodates it. A question I’m asked daily is about my gearing. Some of us have had the experience of being spun out on the trainer or on the road due to mountain bike specific gearing. On my bike, I run Shimano XTR 1×11 (soon to be 1×12) with a 32T ring up front. With the KICKR, it doesn’t matter what gearing you have because the trainer automatically sets the wattage, despite what gear you are in. It’s irrelevant what your chainring size is. I use the cassette that comes with the KICKR with my 1×11 set up. I’m also frequently asked about what I do for training and if I use the pre-set TrainerRoad plans. I write my own program, but it is heavily focused on Sweet Spot training and Over-Under workouts for intensity. Sweet Spot is key for endurance mountain biking, as is over-unders for technical climbing and passing. If you’re not familiar with the term “sweet spot,” it primarily consists of three or four 10-20 minute sub-threshold efforts. I aim for 2-3 days a week of intensity paired with Free-Fatty Acid or zone 2 rides. A typical week is 10-12 hours on the KICKR. I have an app on my computer that breaks down how I’ve spent my time per day and my “entertainment” hours are much higher in the winter! I have a confession to make. My training is actually far more structured and efficient in the winter when I ride the trainer. I’ve even spent time on the trainer in the summer due to extreme forest fires and terrible air quality the last couple summers. 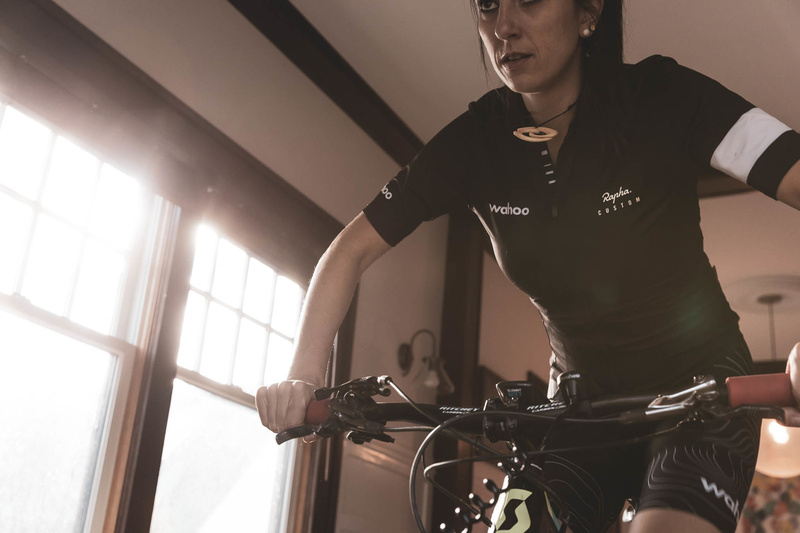 With the KICKR, you can’t cheat the workout because the trainer sets the wattage. With outdoor riding, it’s easy to slow down during your efforts. Also with the trainer, you are pedaling 100% of the time. Outside? 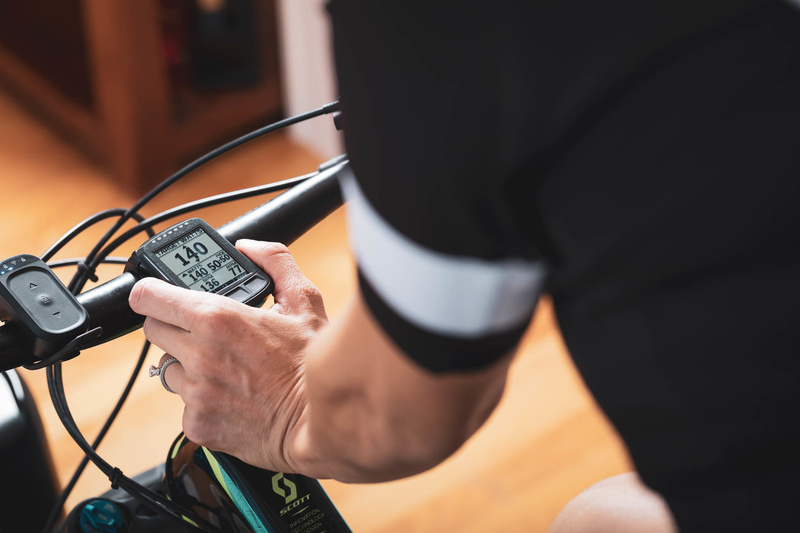 There are descents, coasting, red lights, etc so your actual energy output for a 2-hour trainer ride is higher than most 2-hour rides outside at the same intensity level. Sonya Looney is the 2015 24-Hour World Champion and 4x USA National Champion. She has raced her mountain bike at stage races and 100 milers in the Sahara Desert, Himalayas, tropical jungles, and mountain ranges all over the world. Her spirit for adventure, personal growth, and taking on new challenges has driven her to over 25 race wins during her career. She also is the podcast host of the Sonya Looney Show where she interviews accomplished guests about high-performance living. Sonya has also been a writer for over a decade and is a keynote and TEDx speaker. Make sure to connect online and for more tips and articles, Sonya offers a free bi-weekly newsletter. Next article Is E-Racing the Future of Cycling?